TORONTO, November 7, 2016 - “Helping clients thrive and communities prosper” are six powerful words that inspire RBCers to do their best for our clients, communities, and each other. Last year, we held The Vision & Values Jam – Our Future Your Voice, a 55-hour online brainstorming session with 20,000 employees participating from around the world. Our objective was simple – provide all RBCers an opportunity to discuss the role our Vision and Values have in how RBC will succeed in the future. Our inclusive workplace culture includes really listening to our colleagues and putting suggestions into action, one of the reasons RBC continues to be an employer of choice. Once again, RBC has earned a spot on Canada’s “Top 100 Employers” listing, an annual evaluation of Canadian businesses published by Mediacorp Canada Inc. RBC is being recognized for our efforts in creating a high performing, collaborative and inclusive workplace where we listen to employees and help them reach their full-potential. The Canada’s Top 100 Employers competition is the largest editorial project of its kind in Canada. This year’s winners are being announced today in a special magazine co-published in the national edition of The Globe and Mail. 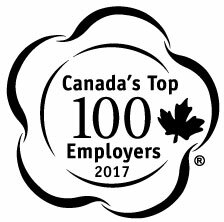 For the full list of Canada’s Top 100 Employers for 2017, visit www.canadastop100.com/national. To learn more about RBC’s awards and recognitions, visit www.rbc.com/top100.